A black and white portrait of May Irwin. This is a blended photograph and pencil sketch. 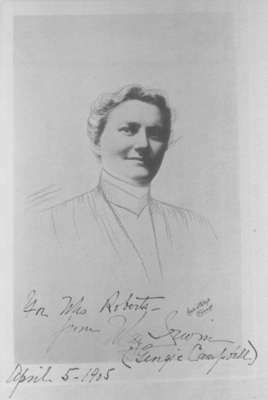 This photograph and pencil portrait was signed to Mrs. Roberts on April 5, 1905. Mrs. Roberts must have known May Irwin when she was young, for she signed her real name (Georgie Campbell) as well as her stage name (May Irwin). Archives at Whitby Public Library maintains a collection of Irwin’s sheet music and associated ephemera. The sheet music in this archive is hate speech. The sheet music represents some of the most popular music of Irwin’s time, and as such constitutes important evidence of the anti-black racist and white supremacist ideologies that impacted and continue to influence Canada and America today. These ideologies are not condoned by Archives at Whitby Public Library, but the Archives has preserved such records in the hopes that, by encountering them, people will begin to think critically about and challenge historical and current racism.